The Malahide Road Roundabout in Swords which is close to The Pavilions Shopping Centre is most likely the most dangerous roundabout in the country. There's an average of 2 crashes per day on or close to the roundabout. The most likely place to be involved in a collision is after coming from The Malahide Road while turning right [ taking 3th exit] . The problem arises when the vehicle coming from the Malahide Rd. and is on routh to The Pavilions decides to enter the roundabout in the left lane. There may already be traffic in a stationary position on the roundabout having come from the north of Swords and are heading to Dublin in the right lane. When the traffic starts to move the vehicle that came from the Malahide Rd. decides to turn right in the left lane and the vehicle that came from the north of Swords is going straight towords Dublin, this is the most common crash on this roundabout. As you can see from the photo on the right the road marking are vague and some people may be confused. While entering a roundabout and taking the third or forth exit then get into the right lane. See image right. The second most likely place to be involved in a collision on this roundabout is when turning right having come from the city and heading towards Malahide and decide to take the 3th exit in the left lane. The road marking are very clear approacing the roundabout while heading north or east towards Malahide. Get into the right lane while turning right. Most times there are vehicles in the right lane who are heading north in the right lane and if a vehicle turns right in the left lane there may well be a collision. A roundabout is much like a crossroads, one should get into the right lane when turning right. There are exceptions to the rule. 1 when coming off a motorway one is often permitted to turn right in the left lane. 2 when the local road marking say so. The 3th place most likely to be involved in a crash on the roundabout is while traveling east from the pavilions towards the N1. The road marking on this road are incorrect. They state one can go straight [ 1st and 2nd] exits coming from the pavilions. If traffic is expected to be able to travel to the Malahide Road in the right lane, which is suggested by the marking then the centre lane on the roundabout should clearly say so. But the centre lane says right turn only. Again this is very confusing. To stay safe get into the left lane coming from the Pavilions if heading to the Malahide Rd. And get into the right lane if heading to the Drynam Rd. or towards the city. The average cost of a claim in Ireland is €4,300. With two crashes per day on this roundabout the cost is €8,600 per day. On a yearly basis the cost is estamated at €1569500. The figures of the average cost of claims are from The Central Bank Of Ireland. Several things could be done to bring down the amout of crashes on this roundabout. The first would be to make the road marking clear. This would involve writing the names of the road you intend to take while approaching the roundabout, example, when coming from the Pavilions you would see on the right lane approaching the roundabot the words Drynam And City Only and the left lane would say Malahide And Northbound Only. The second would be to switch off the traffic lights. It has being proven time and again that when the power fails on the traffic signals this roundabout doesn't get backed up with traffic. Give it a week and monitor what happenes. After all these lights are from a previous time before the M1 Extention was built to bypass Swords. The photo. above shows a crash on the roundabout. The small silver car had come from the Malahide Road and was heading towards the pavilion centre in the left lane. The large grey car was travelling up the duel carriageway and heading south bound towards Dublin in the right lane. The large grey car had being stopped in traffic on the roundabout. In the meantime traffic from the Malahide Rd. had started to move on to the roundabout in the left lane but the right land was still stationary. When the right lane started to move the large grey car continued un his journey but an this stage the small silver car was turning right in the left lane and ''Bang'' . Although this was not a serious accident it puts the price of car insurance up for all. Again this is a reminder to Fingal Co. Co. who have recently carried out a traffic survey on this roundabout and found no faults, the mind boggles at this survey as the above kind of crash is happening on a daily basic on this ''Most Dangerous Roundabout''. It simple isn't working as anybody that uses it will tell you. Response From Fingal County Council To My Article On This Roundabout. 1st Of May 2014 In The Fingal Independent. A Roundabout in Swords considered to be difficult and dangerous to negotiate by many appears to be considered safe by the council who said the number od accidents at the notorious location are within the normal range for a roundabout. Over a four year period between 2009 and 2013 The Malahide Road Roundabout in Swords saw 56 accidents that caused material damage to the vehicles involved, according to the Garda figures quoted by the council in response to a query by Cllr. Anthony Lavin. However none of these accidents resulted in a fatality or serious injury. Fingal County Council's traffic section said of the statistics, ''These figures are not considered to be out of the range for such busy roundabouts. The signage both on the approaches to and exit lanes of the roundabout were upgraded to the appropriate standard as part of the recent Regional Road Signage Project, and provide good directional information to the drivers using the roundabout. No additional road marking are deemed necessary. My response to Fingal County Council. For starters I stand over everthing I wrote in the original article. You said - ''Over a four year period between 2009 and 2013 The Malahide Road Roundabout in Swords saw 56 accidents that caused material damage to the vehicles involved, according to the Garda figures'' Well theses figures are totally meaningless as one is not required to report a road traffic accident to a member of the Garda unless someone is injured. And yes, I still see accidents on this roundabout on a daily basic so my original figure of one road accident per day stands. You Said - ''The signage both on the approaches to and exit lanes of the roundabout were upgraded to the appropriate standard as part of the recent Regional Road Signage Project'' . My response is that the only new signage , was actual the removal of the large ''Roundabout Ahead'' sign which was located at the junction of Longlands and the Malahide road. This sign should have been removed when The Pavilions opened years ago. The sign suggested that at the next roundabout one should take 4th exit for Dublin. In other words turn right for Dublin which would have left you driving into The Pavilions thinking you were on the way to the City and since May 2001 until 2011 this sign was left at Longlands and directed many's a car and lorry into the pavilions by mistake. You Say - No additional road marking are deemed necessary. I say the road marking are still misleading and wrong, especially coming from Pavilions to Malahide Road Roundabout which suggest one should drive in the inner and outer lanes to get to Malahide. So if both lanes suggest the same straight ahead markings then when one gets to the roundabout only the left lane on the roundabout says you can drive to Malahide. These marking should be made clear by writing on each lane as to where that lane leads to. Example on the outer lane coming from Pavilions to the roundabout the words ''Drynam And City'' should be written. On the inner lane the words ''Malahide And Northbound'' should be written. To the right in the youtube video is of a busy intersection in Poynton England. The junction was totally transformed to make it user friendly for motorists and pedestrians alike. Before the works began the junction was unbearable for all road users. They have now integrated that whole area to make it part of the town. Accidents have been considerably reduced. The long term plan for Swords is to transform it into a mini city. Reforming this junction would make a great start. In the video some joined up thinking was required with everybody having a say, not just an engineer sitting in a planning office. Above is just one example of what can be achieved instead of just having a ''Ploughed Field'' close to the heart of the town. There's a misconception that if you take away the traffic lights people will drive faster, the opisite is in face true. It's the Green light that encourages the speed that licenses aggression. If you take away the lights there's uncertainty at the junction people naturally approach slowly. This junction is not only unsafe for motorists it's also a death trap forcyclists where the vast majority refuse to use it on safety grounds. It's also unsafe for pedestrians, especially those coming from the Pavilion centre heading towards the Malahide Road who have no safe way of crossing this duel carriageway. The footpath simply stops at the traffic lights at the roundabout with pedestrians having to step out onto the busy road and then walk along a dirt track and then negotiate a safe way to cross 4 lanes of traffic. Everything about this roundabout is set up in a way to suit traffic [ And This Doesn't Even Work Well] with pedestrians and cyclists risking their lives on a daily basis. 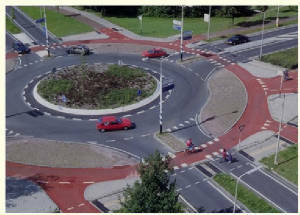 The above image is an example of a pedestrian and cycle friendly roundabout. The photo was taken in America where they have only recently embraced roundabouts. They seem to be heading in the right direction as there are dedicated pedestrian areas to cross in safety. This is the standard all local authority councils should be aiming for. It would also encourage more motorists to leave the car at home.